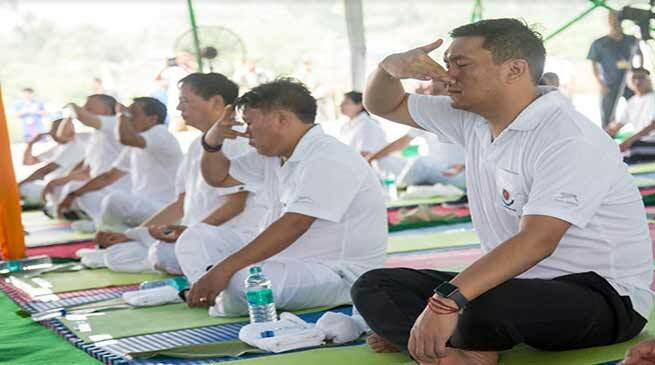 Along with rest of the country, Chief Minister Pema Khandu today took part in the celebrations of 4th International Day of Yoga here at the headquarters of 1st battalion of Arunachal Pradesh Police at Chimpu. The event was also participated by ministers, parliamentary secretaries and other officials. The state police department organized the event with over 300 participants comprising of police officers, personnel and their family members participating in the yoga practice session following the common yoga protocol. The department has also been organizing the month long wellness programme across the 23 districts for the police personnel and their family members culminating in today’s programme. The Chief Minister in his speech commended the state police for organizing the month long activities of wellness month through yoga for wellbeing of police officers and families. The Chief Minister stressed on government officials, police personnel and politicians to practice yoga to fight stress developed due to hectic life. He said by maintaining overall psychological well-being, we can raise our capability to work and make ourselves more productive. The Chief Minister thanked Prime Minister Narendra Modi for taking the yoga to the United Nations and through it making it as a world event. He said more than 170 countries at the UN had supported the motion for celebration of International Day of Yoga. He also said the date of Yoga Day is special because it is the longest day of the year across the northern hemisphere and shortest in southern hemisphere. The Chief Minister on the occasion released a souvenir ‘Wellness First’ published by the police department. Home Minister Kumar Waii, Chief Secretary Satya Gopal and DGP SBK Singh also spoke on the occasion. The Chief Minister also carried out plantation drive in the battalion compound.